I’ve started to write this blog about 100 times and failed. That tells you quite a bit about a day in the life of a hedgehog rescue! Well, no two days are the same but let me give you a secret glimpse into a day here. 6.00am – Get up and go and check all the patients to see who has survived the night. Collect up food bowls, empty uneaten food and soak them in sterilising liquid. Check on the wild hedgehogs in the garden and top up their food bowls. 6.30am Weight checks for all hedgehogs. Check list of who needs which medicines. Give all treatments. Some hedgehogs may require 3 or more different medications. Hand feed hoglets. Update all medical records. Clean all cages and replace newspaper and blankets. Put fleece blankets on to wash. Sanitise all hospital surfaces. Clean and sweep the floor. Fleece blankets are quick drying. I do at least one wash a day. 7.30am Respond to messages received asking for advice about hedgehogs. 8.00am Try and fit in a couple of hours of freelance work. I used to have a full time job but it was impossible to fit it around the hedgehogs. 10am. Check up on sick patients and administer fluids under the skin/syringe feeds for the sickest. Hand feed any baby hoglets. 10.30am Receive two calls about poorly hedgehogs. Make arrangements for admission. 11am Check on stocks of food and medicine. Order any items that are running low. 12 noon Admit two hedgehogs. Checks done to identify injuries and illnesses. Fluids given and hedgehogs placed into intensive care. 1pm. Try to fit in some more freelance work in between following up leads about potential release sites for hedgehogs. Check out the locations on google earth and schedule in visits to go and check them. 2.30pm Undertake final health check for a hedgehog that is ready for release. Poo sample tested under the microscope. Test a line up of poo samples for my hedgehogs and those out with foster carers. Mark the hedgehog ready for release. Pack up a bag of food for the finders to use over the first few days. Hand feed hoglets. 3.30pm. Another call asking for advice about a nest of hedgehogs that has been disturbed. Offer advice for the nest to be monitored. 4pm. Check messages asking for advice about poorly hedgehogs. Make some jewellery (which I make to raise funds for the rescue). Update hedgehog admission records and tidy up the shelves in the hospital to put away items of food that have kindly been donated. 5pm. Clean out any hoglets. They make such a mess that they need cleaning at least twice a day. Check on any patients in intensive care. Undertake food rounds to top up food in all cages. Hand feed hoglets. 6.30pm Finder arrives to pick up a hedgehog for release. 7pm Manage to grab some dinner but it is interrupted by a call about a sick hedgehog. 8.30pm. Admit a hedgehog covered in fly strike and ticks. Spend the rest of the evening removing fly strike, giving fluids and intensive care. Hand feed hoglets. 9.00pm. The hedgehogs have pulled up the lining of one of the cages. Ask my lovely husband to undertake some maintenance whilst I look after the new admission. Try and get some sleep and do it all again the next day! I run a small hedgehog rescue in York, England. My work is entirely self funded. You can read more about me here and also how to support my work here. Like all wildlife rescues, my hospital is entirely self funded. 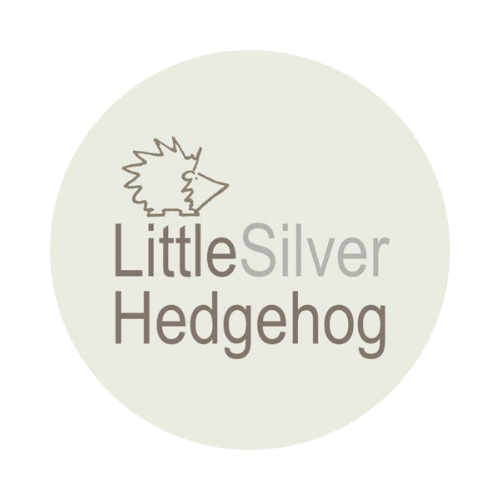 I make handmade silver jewellery inspired by nature and wildlife to raise vital funds for the hospital. You can visit my online shop here. The recognised hedgehog course for hedgehog rescues and vets is run by Vale Wildlife Hospital. You can find out more about their work and the one day course here. It really is a full time job. How many hedgehogs you have in your hospital? You are an amazing lady, I wish you all the best, healty hedgehogs and donations to continue your very important work. I’m worn out just reading this LSH! You are a “Hedgehog Inspiration”. Promise to invest in some silverware in due course! An update on “hole in the gate”. Hedgies are regular visitors – you can almost set the clock by them! The best recent visit was a youngster going it alone. No pics yet – working on it! You are so kind and the best news you have regular visitors!!!!! Would love to see pics when you have them! I found this amazing blogger during 30 days wild. Just so full of admiration for her work for hedgehogs. Hoping to attend her open day next month. Do check out her jewellery which looks fabulous. Reblogged your post to bring you and your amazing work to my readers. I think you are amazing. Sounds like a busy day then getting family involved. That’s how to get things done. Oh goodness, so sorry only just seen this. What did you do in the end?